International train travel to/from Amsterdam is efficient and pleasant (as long as you're traveling outside the rush hour). There are direct train connections from Amsterdam to e.g. London, Paris, Brussels and cities in Germany. From there, you can get a train to almost any other European city. Check our other page if you need information on domestic trains in Amsterdam and the Netherlands, as well as Amsterdam train stations. International train travel to Amsterdam is ever getting better. The Eurotunnel connecting the UK and France means you can take the train from London to Brussels (taking around 2 hours) and change in Brussels for Amsterdam (currently 3 hours). When the new hi-speed network between Amsterdam and Brussels (the HSL) is ready, hopefully in the course of 2010, the Amsterdam-Brussels track will be 2 hours only, and Amsterdam-Paris track only 3 hours (meaning a reduction with 60 minutes in both cases). Available International Connections To Amsterdam? The Brussels-Paris-Marseille connection. As mentioned, you can change in Brussels for London (with the Eurostar), and in Paris for several French cities. The Frankfurt-Basel connection. In Duisburg (Germany) you can change for Hamburg. If you're currently in Amsterdam, and travelling to Belgium, Luxembourg or some Western parts of Germany, buying tickets is the same as for domestic trains: right before your depart, through the regular domestic ticketing machines or ticket offices if there is one (see above). 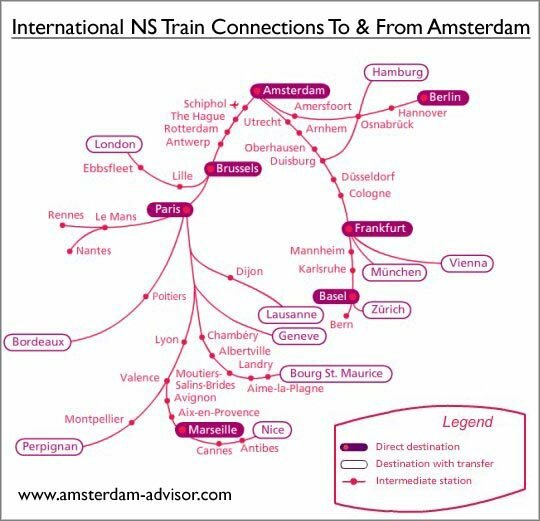 For those trains to the above destinations that require reservations (like the Thalys hi-speed train) you have to either book in advance, or buy a ticket at the international desk (NS Hispeed desk) at Amsterdam Central Station. For all international train travel, even those that require reservations, you can buy a ticket right for departure at the NS Hispeed desk. While NS claims waiting times for immediate departures are short, the queues for advance reservations can be terribly long. It's better to book in advance through the phone (0900-9296) or through the internet (www.nshispeed.nl). Payment, then, is by credit card (MasterCard or Visa). However, NS will only mail the tickets to Dutch addresses. If you don't have a Dutch mailing address, you still have to pick up the tickets at the NS Hispeed desk at Amsterdam Central Station (or any of the other 4 Dutch stations that have an NS Hispeed desk). If you're departing in less than 3 days, NS Hispeed will not mail tickets to anyone, since they might not arrive in time. In that case, you always have to come pick them up in person. For schedules and other information, also call 0900-9296 or visit www.nshispeed.nl. Both are in English, too.